Asymptote blog’s spotlight on Japanese translation continues with this conversation with acclaimed translator Juliet Winters Carpenter! Juliet Winters Carpenter is an award-winning translator of Japanese poetry and prose noted for promoting contemporary Japanese authors (including Minae Mizumura, Noboru Tsujihara, and Ryōtarō Shiba) to English readers by rendering their distinctive prose into precise yet colloquial English. Pushkin Press reissued her translation of Machi Tawara’s Salad Anniversary in a beautiful edition last month. Carpenter describes the wry self-awareness that comes across in Tawara’s poetry with a sense of kinship, suggesting that a degree of self-cognizance, in addition to close reading and writing skills, is required from a translator. Elisa Taber: Kenneth Rexroth famously commented on Japanese poetry and translation, “It is (…) more essentially poetic. Many, especially Japanese, editors and translators have been embarrassed by this intensity and concentration and have labored to explain each poem until it has been explained away.” You seem to encapsulate, rather than expound, the meaning of each verse, by translating the tanka form in three lines rather than the customary five. Were you wary of over-explaining Tawara’s work? In any case, I opted not to use the 5-7-5-7-7 pattern. English rhythm is obviously not the same as Japanese. English is stress-based, but Japanese is not; all Japanese syllables receive equal weight. Also, English generally takes fewer syllables to say the same thing (cf. walk/aruku; egg/tamago; chicken/niwatori), so keeping the same number of syllables often means adding information, padding the poem purely to reach the magic number of 31. I decided that I would respect Tawara’s own definition of the tanka as a “short, rhythmical poem” and seek above all to maintain the succinctness and flavor of the originals. My translations fell naturally into three (occasionally four) lines. I thought my editor might raise an objection, but he liked the samples I did and so I stayed with that form. ET: American and Japanese pop culture references are scattered seamlessly throughout the text. How did you approach the translation, given that they sounded neither heavy-handed nor foreign to me, an English-speaking reader? JWC: Thank you for saying they do not sound heavy-handed or foreign! The first section, “August Morning,” is bookended with references to famous U.S. pop songs. It opens with a mention of “Hotel California,” which the Eagles released in 1977, and towards the end references the Elvis staple “Heartbreak Hotel.” Certainly the familiar titles need no explanation—perhaps many readers felt the same pleasant jolt of surprise that I did on encountering them. Together they aptly convey the mood of two stages of a love affair—the tremulous, joyful beginning and the all-too-sad ending. McDonald’s, jazz, baseball, and “Jingle Bells” also appear—missing are ikebana, tea ceremony, and other examples of Japanese high culture. Some items are apparent from context. When she writes, “I listen all day to the Southern All Stars,” for example, we can infer that this is the name of a singing group or band. (In fact it is one of the top pop rock bands of the last few decades in Japan, beginning in the mid-seventies.) Place names that resonate for Japanese readers won’t do so for readers unfamiliar with Japan, but for that matter how many readers around the world really know what Piccadilly Circus is, to pick a name at random? ET: The classical tanka form and analysis of love affairs in retrospect give the narrator’s exalted emotions a contemplative rather than evocative quality. Do you agree? JWC: I’m not sure that her emotions are exalted… part of the charm of the anthology lies, I think, in the way she captures fleeting emotions that spring from everyday life. It is interesting to me that her book has been unofficially dubbed “Sarada nikki” (Salad diary) by many readers. In fact, the relationship between the “I” of the poems and Tawara herself is not so straightforward… while the poems are, of course, grounded in her experience, they are shaped artistically and in that process the emotions involved may undergo a shift as well. The title poem is an example: in actuality, she made fried chicken, not a salad, and the one who liked it was not her lover, but her father! Another poem, because of its placement, seems to be a love poem but was actually written about an old woman at a newspaper kiosk whom she often exchanged a few words with before getting on the subway. So the mere placement of a poem within a sequence can alter its meaning. ET: Reading poetry requires a different kind of concentration than reading prose. What aspect of the Japanese psyche did Tawara appeal to, in order to reach such a broad audience? Do you believe Salad Anniversary can have the same impact in translation? JWC: I think the whimsy, freshness, and intimacy of Tawara’s poems caught the reading public’s fancy. Then too, she incorporates a contemporary outlook that offers a feminist take on life without being political or dogmatic. Her use of colloquial conversation style and vocabulary in the ancient tanka form also took people by surprise. This last—the combination of new and old—is particularly hard to convey in translation since English readers have no expectation of encountering classical language in poems written in our time. I do think that the emotions and moments she captures are universal and as such can touch the hearts of readers in any language. As a translator, I understand the limitations of translation all too well, but at the same time I firmly believe that translation can and does enable authors and poets to set off sparks in new readers’ minds. I couldn’t be happier that Salad Anniversary will go on finding new circles of readers. ET: How does Tawara subvert or uphold Western readers’ expectations of Japanese poetry? What is Machi Tawara’s place in Japan, both among her contemporaries and in the broader scope of the literary tradition? JWC: Probably most readers associate the words “Japanese poetry” with haiku, the shorter form in five-seven-five. While haiku juxtaposes two images without comment, tanka allows room for the poet’s emotional response. Part of Tawara’s achievement at home and abroad was rejuvenating and raising the cachet of tanka, which had been fairly well eclipsed by haiku. She single-handedly revived the older form and made it contemporary and hip. I would say a common strain in Japanese poetry is melancholy, but Tawara’s poems, while often thoughtful or wistful, have an undercurrent of joy, sharpened by a wry sense of irony. Tawara remains a highly respected voice in Japan, and the changes she wrought in tanka have assured her a lasting place in Japanese literary history. She continues to write poems based on her experience as a single mother, and more. ET: How has living in Japan affected your writing process? Has speaking Japanese daily made you more aware of the language’s cadence? Do you struggle to maintain your proficiency in English? JWC: I became a writer in Japan. I have lived here most of my life, for some forty years now. The writing process for me is one of continual thinking and rethinking, shaping and reshaping. It is a process that never really finishes. What I enjoy most about it is seeing words come closer and closer to something like truth, the way a camera lens can bring an object into ever greater focus and clarity. As far as maintaining my proficiency in English, I do use the language at home and with friends, so I don’t think my English skills have suffered too much. I make an effort to read contemporary writers when I can, and communicating with my younger brother and his wife and daughter back home in the States also helps keep me up to date on currents in American English. My husband and older sister offer invaluable advice on almost everything I write. Of course, the opportunity to speak Japanese and hear it spoken in many contexts as I go about my daily business has been invaluable in raising my awareness of the language’s cadence and range. ET: To what extent do you view translation as a creative or interpretive act? Do you abide by a translation philosophy? Elisa Taber is a multinational poet, translator and photographer. Freelancing enables her to shuttle between Argentina and the U.S. Currently, she is writing a book of poems titled Mark Making and translating a compilation of Nivaklé myths, an indigenous tribe of the Gran Chaco. Elisa manages Spanish social media for Asymptote. See her website here. *A previous version of this post erroneously referred to Salad Anniversary as a recent translation by Juliet Winters Carpenter. The reissue includes an additional poem that was left out of the Kodansha edition and one alteration in the translation. 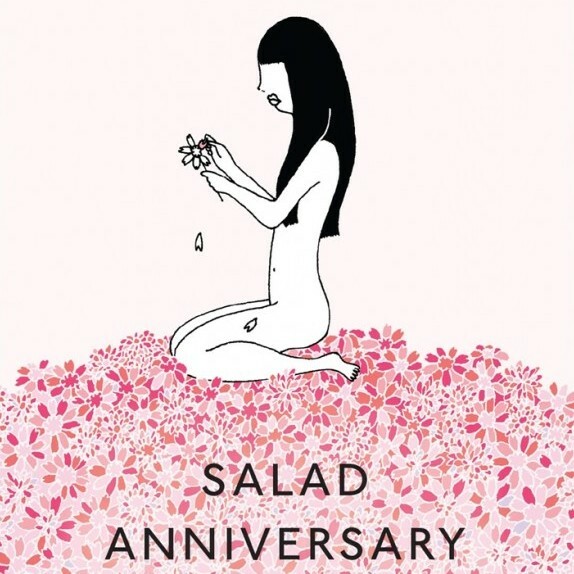 I don’t quite understand: how is this a new translation of Salad Anniversary? I have a copy translated by Juliet Winters Carpenter dating from 1989.